The lights in the arena go black. A green glow surrounds the ring. A loud explosion is heard followed by green flames shooting from all four cornerposts. Hasha Koroshiya's theme, "Gouka," blasts through the arena as his logo goes up on the X-tron. The lights come back on. The crowd boos loudly as Hasha makes his way down the ramp to the ring. Hasha climbs into the ring and climbs a turnbuckle to the second rope. 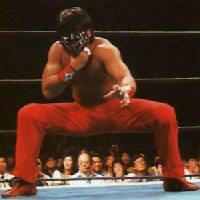 Tenay: Here comes the terror from the orient, Legend! Zbyszko: The fans here don't seem to realize that they are in the presence of a great wrestler. Tenay: Yes, Hasha Koroshiya is quite the accomplished wrestler. Hasha: Well, well, well... Looks like all you pathetic excuses for fans were going for the wrong duo Monday night at Carnage. I beat that Cripple and Schoolgirl all by my lonesome. I didn't need that pansy assed Double Gay at all. He may have come in and got the pin on Schoolgirl, but I did all the dirty work. He was probably in the back stroking it with that creep in black. Zbyszko: You can't deny it, Hasha did most the work. Jarrett was pretty much MIA for most of the match. 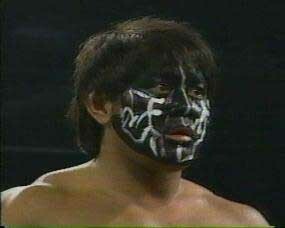 Tenay: Koroshiya was a man possessed at Carnage, Legend. He definitely was a man on a mission. That mission, to take out the World Heavyweight Champion and the injured Draka. Hasha: I proved to EVERYONE that I am the best thing going in the XIWA today. And as for that reject Prodigy? Some prodigy. You want to stick your nose in MY business again? The same result will happen, a boot to your freakin' head! Why don't YOU shut up and know YOUR roll. You were on MY time, chump. Try it again, and you'll wish you never LEFT that minor league you call federation. The crowd boos Hasha. Hasha shakes his head in disgust at the crowd. Hasha jumps up and sits on a turnbuckle and continues. Hasha: That's right girls, you choked. And hard at that. Shawna told you to keep your head in the game Draka. Where was it? Was it up Hunter's shorts? Were you thinking about how good Arriba moves around the ring? What was your excuse Draka? I can tell you where your head ended up. In the loss column, courtesy of Hasha Koroshiya. And Schoolgirl Shawna... What happened to the almighty champion? Did you forget how to wrestle in a weeks time? I've had better battles with bad sushi! The crowd is in a monsterous uproar. Chants for Maverick and Draka echo throughout the arena. Hasha raises his hands high as he is begging the crowd to chant louder. He hops up to a turnbuckle and motions for more. Hasha: I don't know who you think is going to stop me. I've already beaten the so-called best the XIWA has to offer. All I have to do now is get that gold strap off of Shawna's waist. And believe me, he's gonna put that strap at my feet, lay his shoulders on the mat and let me pin him, 1, 2, 3. He doesn't want any more of the Japanese Assassin. He laid down on Carnage, he'll do it again. Hasha sprays Gouka in the air. He flips himself over the top rope and exits under the X-Tron. Zbyszko: The self-proclaimed next champion has spoken. Tenay: I don't think the other stars in the XIWA are going to take kindly to these comments. Hasha has put forth his plan, now let's see if he can execute it. Zbyszko: We'll see Professor. It may not be as easy as it looks. Any time you go up against a champion and try to take what he thinks is his, you'll have a battle on your hands. I know, I've been on BOTH sides of the strap. Tenay: I couldn't agree more Legend. Stay tuned to the XIWA folks. It's what the world is watching!